Back of card: Violet tones, based on the Ace of Pentacles. May be inverted. Booklet included: Yes, 64 pages, 2.6 x 4.67 inches, or 65 x 119 mm. Instructions in English, Italian, Spanish, French & German. Comments: The idea for this deck was to rotate the standard Rider-Waite deck by 180 degrees. Instead of seeing the front of things, we now see the back. It's claimed this secondary view compliments & completes the Rider deck. I confess I didn't care for the idea as much as I hoped. Most of the rotated cards seem pedestrian. 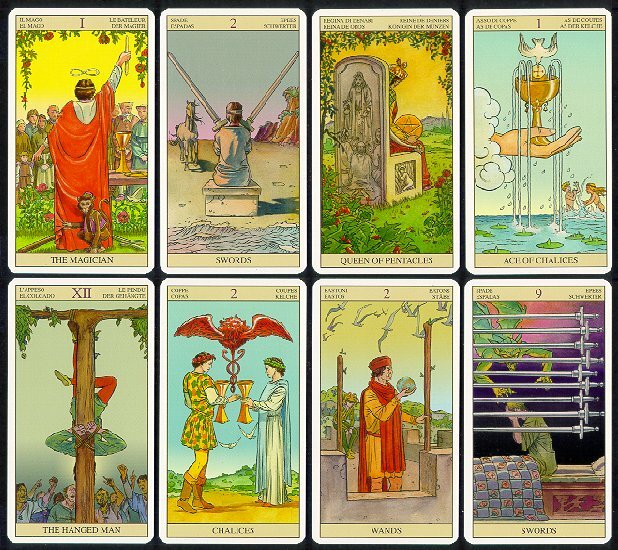 Rotation changes the meaning of the cards, sometimes, as with the Hanged Man (above) drastically. The notes on the cards in this deck are vague, perhaps deliberately so.